Remember how we met? It was unexpected and quickly we paired off. At the time, I was not looking for a relationship, and you had just abruptly ended your last. I moved my things in and hurriedly acquainted you with my hobbies and habits, the irregular ebb and flow of my work patterns, my busy schedule that took me far away from you days, sometimes weeks, on end. It was a tenuous beginning, but we were good together, and I was insistent that things would only get better. I did not rearrange the furniture, nor did I have any of my own to contribute. I was naive and inexperienced. You had scars of your own. Yet, we tried new things, we made big messes, we cleaned them up. There were a few instances when I abused you. Moody and caught up in the thick of my own thoughts, I left food to rot on your shelves, destroyed portions of your walls, let the clutter build on top of every table and in every corner. Honestly, there were moments I wasn’t sure. 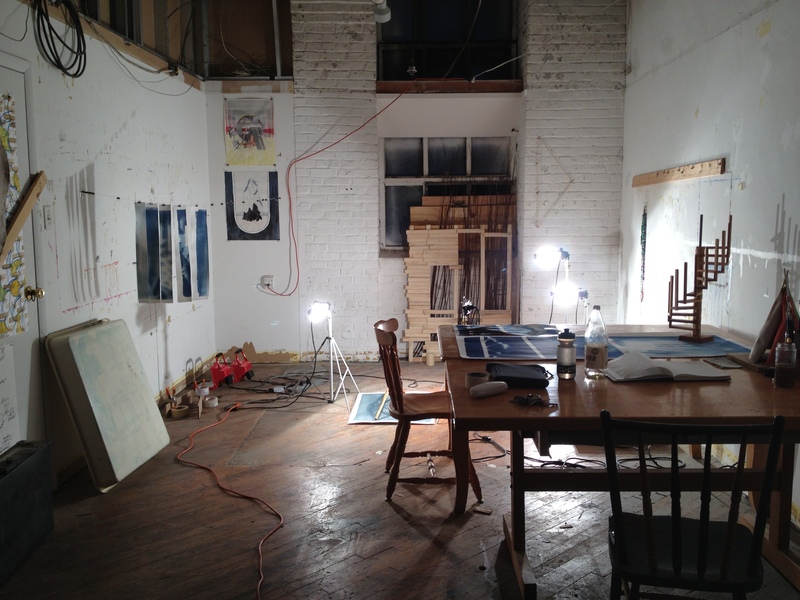 I checked out other studio spaces. I thought about moving back home. The idea of coming to you daily made me depressed. I put these appointments off. I didn’t want to come. You didn’t help matters, I am not blaming you, we are both to blame in this. Then things got better, the weather improved, masking your absence of warmth. I took the time to think about things. Get motivated again, commit to inspiration. I bought new things to bring to you. Diligently saw a few projects through. Those projects didn’t go anywhere, but they were not a waste because they reintroduced us to each other. Last week I finally rearranged the furniture. I unpacked all of my things, finally moved the unused into your extra storage space. I helped clean you up. I swept the floors and filled three big bags full of garbage. Together we gave everything a place. I hung things on your walls. We spent the week together. We tried new things, we made big messes, we cleaned them up. We felt the love for one another again, like we did in the beginning. I was forced to leave you this weekend for prior engagements. This morning I woke with a headache, less than thrilled with what the day held in store for me. Then I thought of you, and how I would be able to return to you tomorrow. It was only after coffee that I realized it has been a year. Today is our one-year anniversary. I wanted to write you this letter, to let you know how I feel about you and to thank you. I am glad we stuck it out. I am happy we saw it through. Thank you for giving me a place to put all my stuff. Thank you for allowing me to make big messes and then clean them up. Thank you for giving me a space to grow, sometimes in the wrong direction, sometimes in the right. Thank you for giving me the security to try new things with you. Thank you for always being there, even when I take you for granted. I have learned so much from you. I would not be the person I am today without you, dear Studio. I love you, and I look forward to our next year together.